The many discussions I have recently had about the effort that is now in place to get to DAC evaluation criteria 2.0 have prompted me to write a few more posts in this series. It will also be a bridge between the earlier series and my new posts on Evaluation for Transformation. In May 2018 I weaved my keynote presentation at the UK Evaluation Society Conference around the notion that convention can hold us back without us noticing the detrimental effect of outdated ideas on what we do; some ideas have to die to accelerate the evolution of a field, especially when new circumstances demand (sometimes drastically) new ways of doing and thinking. Can we agree on some in the field of evaluation? And should we let them die a slow death from natural evolution or hasten their demise? 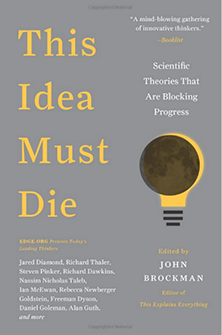 This came to mind as I was reading the delightful book This Idea Must Die: Scientific theories that are blocking progress, to which I already referred in a previous 2016 post where I argued that we need the same type of book for evaluation. In 2-4 page chapters, each of the renowned authors provokes by tackling widely accepted convention in science through topics such as the “power of statistics”; the “myth of cognitive agency”; “large RCTs”; “statistical independence”; “bias is always bad”; “cause and effect”; “absolute truth”; “evidence-based medicine’; “things are either true or false”; and “the magic of big data”. The book has several hundred of these very short chapters, many relevant to our own field of evaluation or M&E / MEL / MERL / MEAL / MERAL, as we tend to call our practice in the South. Good food for thought for the global evaluation community. One, that randomized control trials (RCTs) are at the top of an “evidence hierarchy” – an idea which is taking too long to die, as ITAD points out as well as many other very credible authors. Two, that evaluation is primarily about “programme evaluation”, or that individual projects and programmes should continue to be the most prominent evaluands. Evaluation should be conceptualised in terms of “supporting development” at national, regional and/or global level – now more important than ever given that the whole world has to “develop” in line with the 2030 Agenda for Sustainable Development. Three, that “impact” is meaningful without any attempt to discover (i) whether there is a fair chance that the positive impacts are likely to sustain or enable further (positive) ripples, and (ii) whether negative impacts of interventions or negative consequences of actions might be neutralising those perceived as being positive. Four, that one can get “best practice” and “replication” in highly complex social and societal contexts. Five, that we can continue to make evaluative judgments across cultures and contexts without making clear the reasoning and values behind such judgments. I am sure we can all add several more that are already dying, yet still not fast enough for the field to move on with vigour. This can be an interesting exercise which will definitely lead to a lot of good debates about the merit of certain arguments. One, that only stakeholders’ interests and needs should determine our evaluation questions and criteria (as discussed earlier in this series of posts). Two, that dominant theories, models and narratives around development are superior to others and therefore should direct how we think about change when we develop our theories of change and evaluate for impact. These usually originate in highly regarded universities and think-tanks in North America and Europe, often perpetuated through a powerful system of multilateral organisations – as demonstrated by examples around economic growth (e.g. neoliberalism), institution building, capacity strengthening and so on. Three, that evaluation consists primarily of “ex ante”, “process” and “impact” evaluation. Yet evaluation can be about so much more than this, and can be so differently conceptualised given the many different types of priorities (e.g. transformational change), approaches (e.g. developmental evaluation; emerging outcome harvesting); types of uses (see Michael Patton’s list of around 12 types of use in the 4th Edition of Utilization-focused Evaluation) that we have to attend to. I hope to explain in later posts why I consider these three ideas as in dire need of killing off. First, that complexity is “too complex”, so it is best to ignore it – in other words, that we continue to fail to recognise the importance of working with systems and complexity because it is “too difficult” to do so. Or that we can brush it off as only to do with “experimentation”, “adaptive management” or “adaptive learning” – shifts that are already quite difficult to make within rigid management and evaluation systems that prize results-based management, logframes and linear, frequently overly simplistic theories of change. Second, that (systems) transformation is a buzzword, soon to be forgotten – in other words, that we do not need to think about transformational change when we evaluate. Quite to the contrary, we need to switch to a mode where we accept that we have to recognise the need for transformational change, and that we can use evaluation to highlight its importance. This is relevant not only in the economically poorer countries and regions in the Global South where the need for transformation is obvious, but also in the economically rich countries in the Global North that have to make significant changes to production and consumption patterns and systems in order to ensure that they stop going beyond what our planetary boundaries can tolerate. In theory at least, we are in this together. What does this mean for our practice? Do we agree that these two ideas have to “die”? If so, we will also have to accept that we have to Do Evaluation Differently, and that our global evaluation system – by that I mean the evaluation architecture, institutions, values, relationships, protocols, etc. within which we all operate – should adjust accordingly. This is difficult, as those who pay for, commission and do evaluation often have entrenched interests and also might have good reasons for not changing, such as resource and capacity constraints. And since our evaluation system – like almost everything in life – rests largely on power relations and hence on the maintenance or rebalancing of power asymmetries, shifts cannot happen easily without the collaboration of those “points of power” who determine and influence the system. This is why the DAC evaluation criteria discussions are so important. They are a key part of conventional evaluation practice, in particular in the Global South among aid-dependent countries. Our governments readily follow. In the DAC criteria revision effort it will be easy to suggest (small) adjustments to the existing criteria. Instead, we have to start by asking fundamentally what justifies, frames and drives their use, as I highlighted in my blog post 3 in this series. In my next post I will demonstrate the importance of totally rethinking what frames our evaluation criteria by using one potential criterion that receives no attention because it is difficult to conceptualise, namely Significance. In the meantime, join the thinking about which ideas in evaluation convention you would like to see disappear – and why. « Evaluation for Transformation 1. Can we please get beyond ‘buzzwords’? I love the title (and content!) of this blog post. It is the sort of thinking that should drive us all – thinking beyond the status quo and examining our reality everyday. What a reaffirming pleasure to read, Zenda. Your dead list resonates with me on several accounts, but I was particularly pleased to see the point that we should drop this idea that development evaluation is about “program” or “project.” This ties in so closely to your earlier blog coupling impact and sustainability. Too often, evaluation is straight-jacketed by the same funding cycles that package aid into discrete programs and projects. Increasingly, I am advocating for portfolio-wide, meta-evaluations. For instance, we are commissioning one now that includes eight investments, and will span over four years. The program is not the focus, but the overall strategic objectives that the aggregate of programs seeks to achieve. Scott, I completely agree with you, and good that you are promoting portfolio-wide evaluations and analyses with more strategic use in mind. These can yield rich and useful data and information that will make evaluation more powerful and used, especially if you have good secondary data and information on which to build. It will help us to get away from the legacy of evaluation that was built on “program evaluation”. We definitely all need to be more thoughtful about the focus and boundaries of our evaluands to ensure maximum benefit for potential users.